Two weeks ago, the eyes of the world were on Times Square, but how did it get that way? 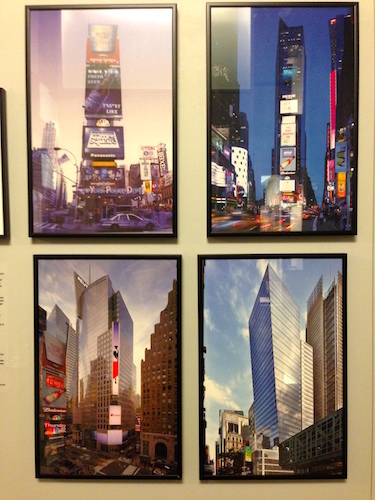 Take a walk through history at The Skyscraper Museum’s exhibition — Times Square, 1984: The Post Modernist Moment through February 15. You’ll find out that the crazy, frenetic, chaotic landscape of this town square and its surrounding theaters was nearly lost when the City Fathers and the real-estate community thought Times Square should be “sanitized”. It took wrecking balls destroying several historic theaters to bring activists, celebrities, actors, historians, and preservationists into the streets and paddy wagons to reverse course. The Skyscraper Museum has assembled the architectural models, videos, personal memorabilia collections, and planning sketches to resurrect this nearly forgotten war story. See the installation views on our Flickr site. The show opens with a 1905 Mutoscope film showing the panorama from the top of the new Times Tower – the first skyscraper in that part of town. See it here on the exhibition web site. The Times started the ball drop in 1907, and it’s continued as one of the City’s most famous traditions. 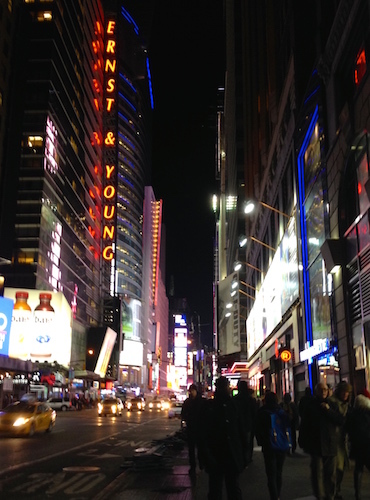 The “Great White Way” name became popular in the 1920s and 1930s to indicate the glow from theater marquees lining Broadway, Seventh Avenue, and the side streets. The second skyscraper wasn’t built until 1927 (the Paramount Building/ Hard Rock Café), and remarkably, no other skyscrapers popped up until 1972. 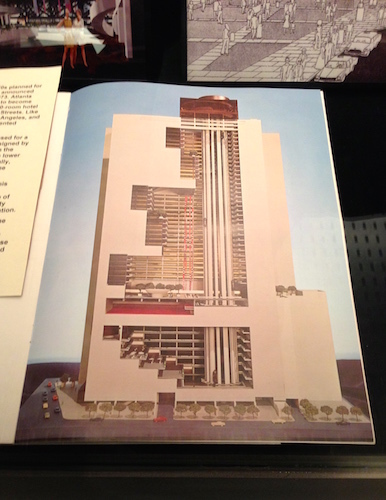 The Portman Hotel (now Marriott Marquis) project was sketched out in 1973, but it took until 1985 to open. The fortress-like complex was designed to look inward on purpose – away from the tawdry street life that characterized Times Square in the “bad old” days when drug pushers, crime, pickpockets, loudmouths, and fistfights were the norm. The atrium and rotating rooftop restaurant were marvels to tourists, who were happy to have an inside-escape route. By 1979, it was so bad outside that the City proposed some drastic plans to make it all better: Why not tear down a few blocks and make an indoor entertainment mall, complete with a 15-story indoor Ferris wheel and the world’s biggest movie screen? Why not make Times Square look more like Sixth Avenue by building monolithic skyscrapers on each corner of Broadway at 42nd? Real estate deals ruled the city at the time, and the bonanza created by tourism was still decades away. 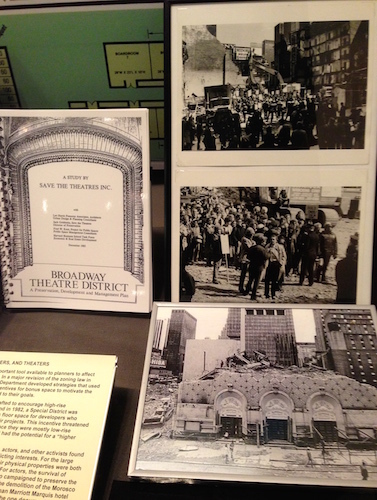 The actors, preservationists, and architects were aghast at plans to tear down so many historic theaters for the Portman/Marriott Marquis and began staging street protests and galvanizing public opinion to save Broadway. Through a lot of community organizing, a Save the Theaters study, and a night where all the theaters turned the lights out, the battle was won. Yes, new towers would be built, but the demolition of theaters would stop. In 1993, Disney pledged to take over and restore the New Amsterdam, the study identified theater features of historic value (including backstage areas), and a 42nd Street redevelopment effort commenced. 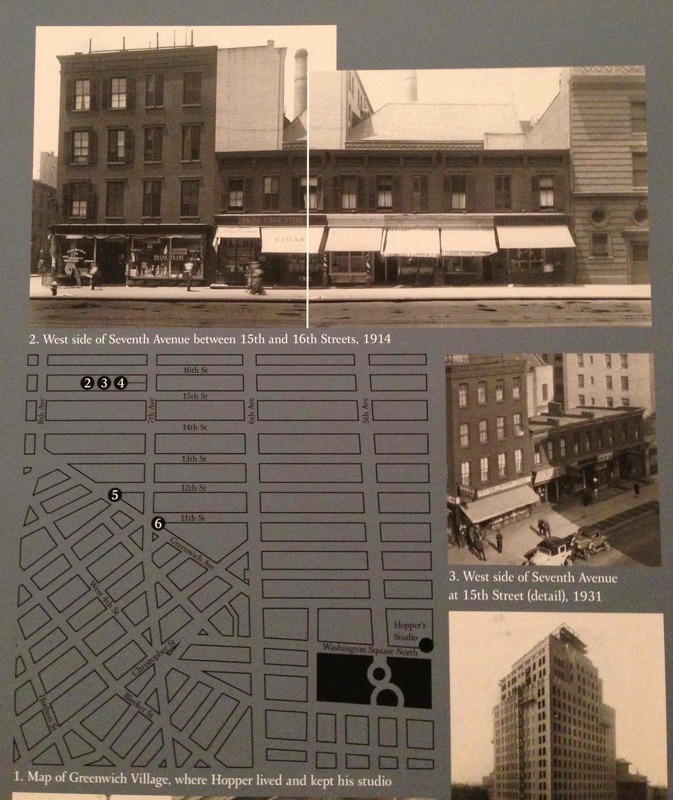 Julian Eltinge’s theater (now AMC Empire 25) was moved 130 feet down the street, rehearsal studios were built, and the New Victory brought children’s theater to a house that used to be Minsky’s (and the Belasco). Today, the crossroads is dominated by tall, sparkling skyscrapers and bustling with high-spending visitors. The TKTS island serves as a concrete village green for the entire area. Insiders at the Skyscraper Museum’s winter program at Columbia University let us in on the fact that the there are actually design requirements for flashing signs and billboards in Times Square to be at off-angles and tilts to maintain the slapped-together look of the area – design elements flouted by Vornado’s new block-long HD video billboard. 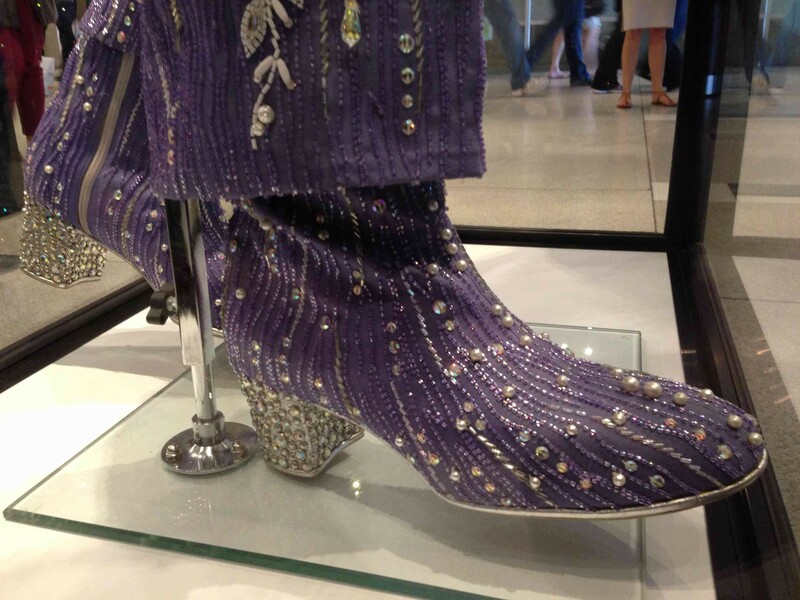 For more, click here to read the exhibition story online and see more photos, videos, and artifacts. 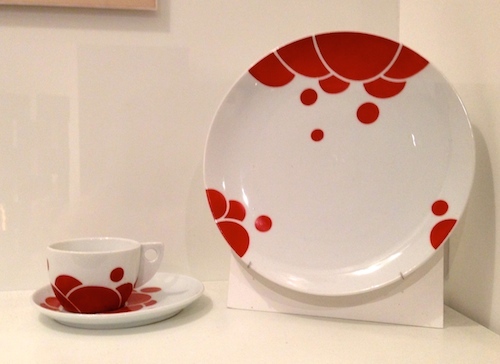 What will the MoMA curators pull out of the design collection next? Designing Modern Women 1890–1990, running through October 19, puts the spotlight on furniture, textiles, graphics, performance, kitchens, and even inflatables designed by some innovative women over the last century. How can you not love a show that begins with 1890s modern-dance provocateur Loïe Fuller and ends with 1980s pop icon Grace Jones? 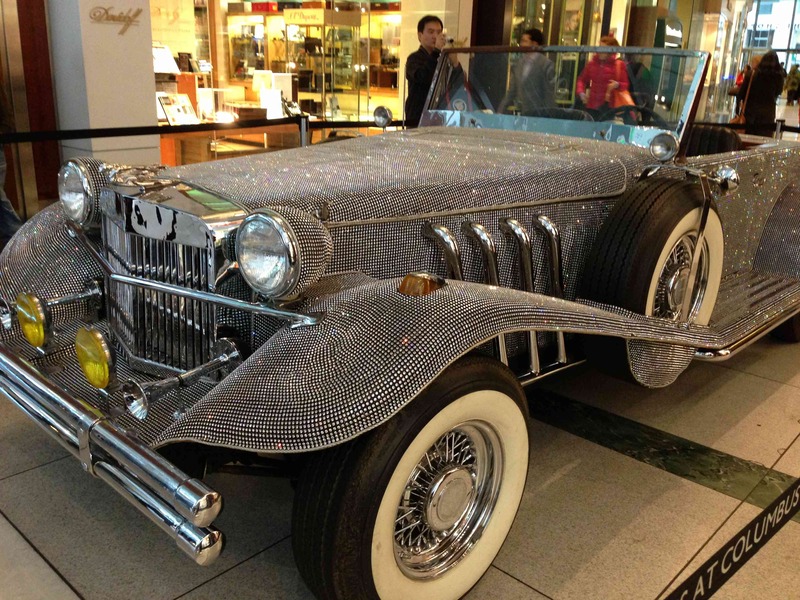 The crowd last weekend was loving every bit of it, pausing to watch videos sprinkled throughout the show and marvel at designs – some 80 to 100 years old that are as modern today as they were at their creation. The next time you carry away your morning muffin from the coffee counter in that little white paper bag, ponder that the flat-bottomed paper bag was invented in the 1870s by Margaret E. Knight and Charles B. Stilwell. Ms. Knight not only invented this classic, but also invented the machine that made it and was one of the first American women ever to receive a patent. No, the dinner service is not from Pottery Barn. It was created in 1901 by the Austrian design team of Jutta Sika and Koloman Moser. 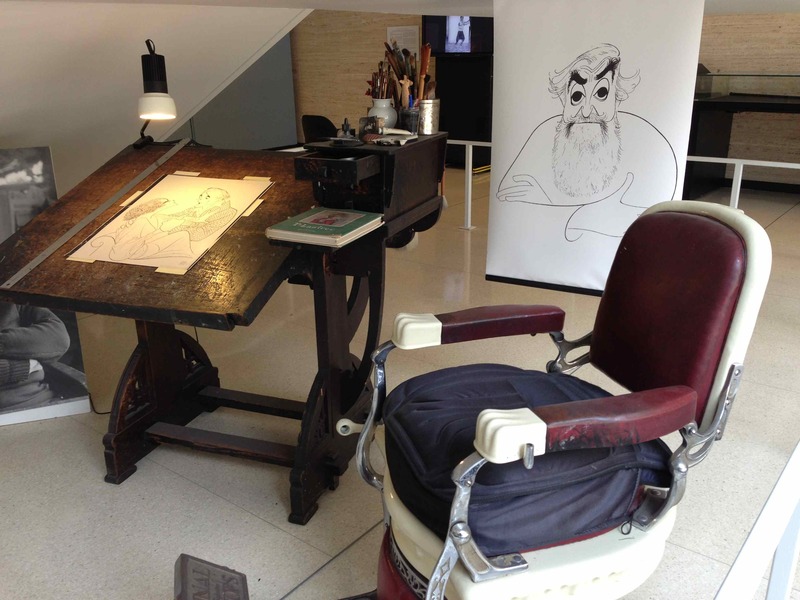 Didn’t I just see a copy of Eileen Gray’s 1927 adjustable table at the D & D Building? Open shelving in your new, modern kitchen? Yes, that was Charlotte Perriand’s idea, and MoMA has (for the first time) installed this full-size, fully efficient, ground-breaking kitchen from her 1952 project with Le Corbusier. 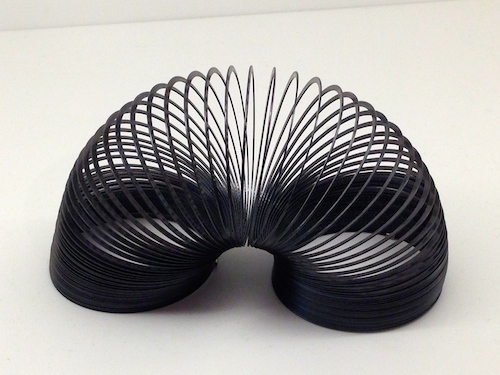 And what about the Slinky? Invented by Betty and Richard James in 1945. You’ll have fun peering into the design cases and learning more about the women behind some remarkable things. 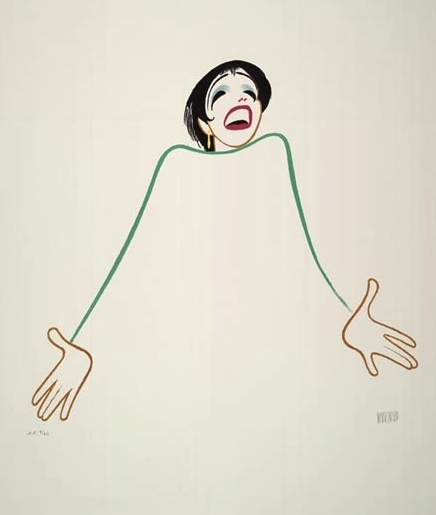 In the 1960s portion of the show, you’ll see those famous Fillmore posters designed by Bonnie Maclean. And there’s an entire wall filled with iconic pop and punk graphics – all created by female designers – that should be familiar to anyone that traversed the downtown CBGBs scene. There’s no digital media to accompany this fantastic show, so take a walk through our Flickr site. All of the items are from MoMA’s own collection, and we’ve taken slight liberties by arranging the photos in the show album in chronological order of the year that each design debuted. And to bring it all back to the beginning of this design innovation tribute: Here’s a glimpse of 1897 Art Nouveau performance art by Loïe Fuller, courtesy of the Lumiere Brothers. The color you see here is a result of hand-tinting the film, but her actual perfomances used new theatrical stage lighting for which she held numerous patents. Listen to the MoMA curators explain her influence, but get over to MoMA (or the Flickr site) to take in this super-fun tribute to 100-plus years of smart women who thought differently and made it happen. 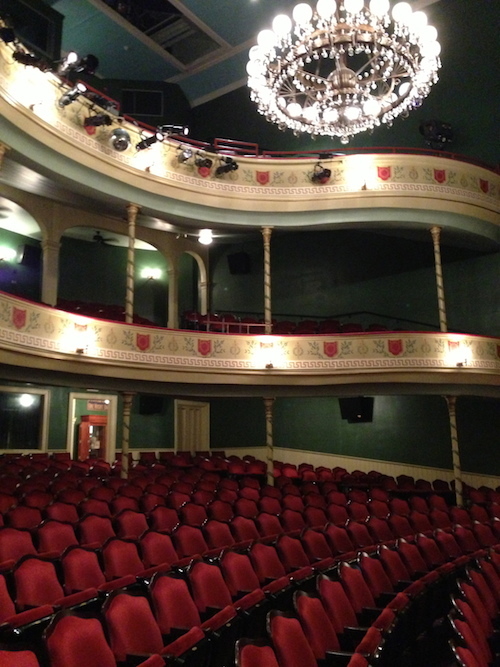 Lincoln was prepping for his sixth debate with Douglas in Illinois when the curtain went up on October 12, 1858 at Thalian Hall in Wilmington, North Carolina – the same curtain, still on display, that is considered to be the oldest existing theater drop in America, painted by Philadelphia-trained landscape artist William Russell Smith. Back in the 1850s, major theaters up and down the East Coast were in pursuit of the classically trained Smith to create romantic, ethereal landscape images on the gigantic canvas curtains that audiences saw when they entered opera houses. Typically framed by an ornate proscenium, the drop transported theatergoers to the work of make-believe, Moliere, and Macbeth – staples of the touring companies and troupes of the time. Today, except for Wilmington’s Thalian Hall treasure, those grand masterpieces are gone, victims of time, decay, and impermanence like the superstars of yesteryear. It’s quite a miracle that Thalian’s original curtain has still survived, considering that it’s not painted in oil, but distemper – a less permanent, water-soluable medium, essentially colors ground into glue. When an artist applies the wet pigment, he sees the opposite color, which gradually turns into the “true” color when the paint dries. It’s a process that could only be executed by a skilled master, particularly on a 30-foot wide canvas. The surface of the curtain holds the granules (like a piece of paper holds pastel fragments). No wonder Smith purpose-built a huge studio in his home with poles that could be raised and lowered as he worked on a gigantic scale first with a charcoal sketch, then with distemper (move over, Chuck Close!). 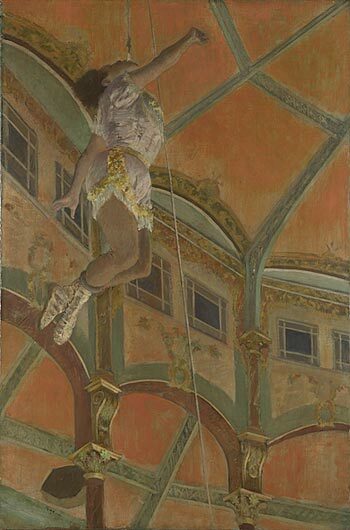 When Smith finished painting his commission, he carefully folded the canvas, rolled it on a long pole, and had it delivered to the opera house. 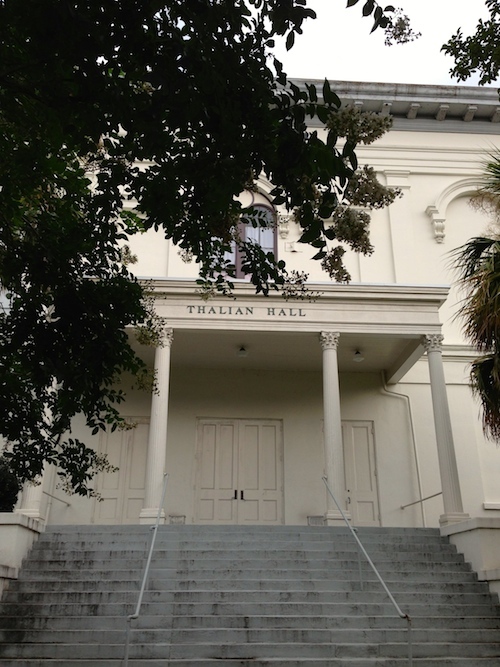 Thalian Hall received its long-distance delivery this way, because Smith never set foot in North Carolina. The new opera house was designed by New York architect John Trimble, who built Barnum’s Museum and many New York theaters of the mid-1800s, including the New Bowery. 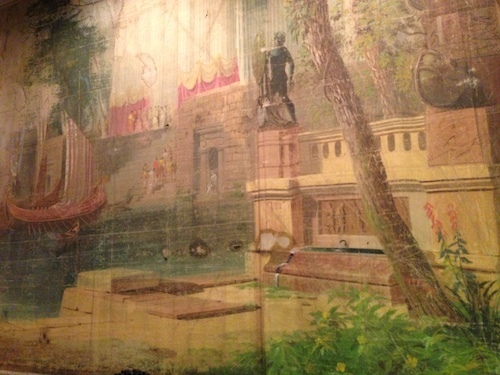 Smith’s curtain was the finishing touch, depicting an Aegean sailing ship arriving at classical islands filled with temples dedicated to Apollo, evoking commencement of the ancient Olympiad. The curtain was in service from 1858 until 1909, when a restoration was planned. Historians know it was hung again by 1938 (see the photo in our Flickr feed). It got hurt a little in the 1940 WPA renovations, and was known to be back in place in 1947, but disappeared after 1963. It was rediscovered in 1979, when Mrs. Juanita Menick, the president of the board, told the new Thalian director that she might still have an old curtain that she took years ago to her home for safekeeping. Thank goodness for those large, Southern homes. Although only 15 feet of the original 30-foot drop remained, tribute was paid to the historic artwork. 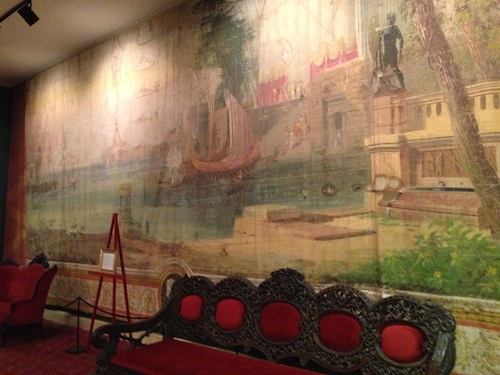 The fragile canvas was used as part of the set for Thanlian Hall’s 125th anniversary celebration, and now hangs, ready for its closeup, in the luxurious entry to the theater’s orchestra section. Hear how executive director Tony Rivenbark rediscovered it, and watch historian David Rowland’s talk about the life of William Russell Smith (at 4:20), whose romantic landscapes of New England somewhat predated the Hudson River School; the imagery used in the magnificent theater curtains (at 30:22); and the astonishing discovery recently made in Smith’s grand studio (at 35:30) in this YouTube video. You can read more about the historic theater on its website (and check out the video on Thalian’s “thunder roll” device, another “only remaining in America” theatrical wonder). 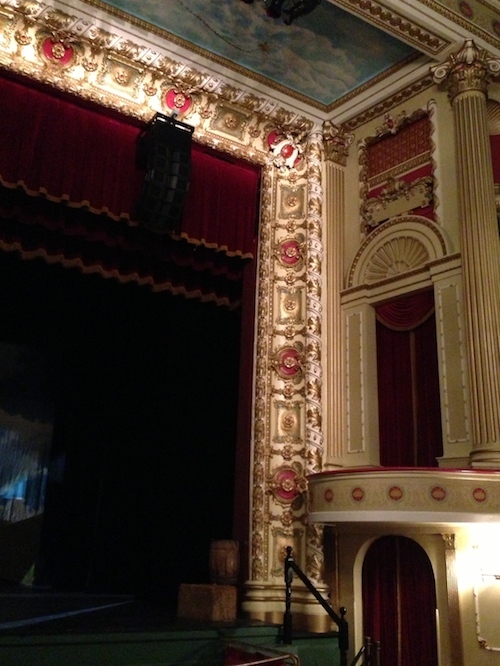 Glimpse more of this theater’s grandeur and photos of the illustrious performers who have trod its boards on our Flickr feed. In Wilmington, you can view this remarkable piece of theater history any time during box office hours. 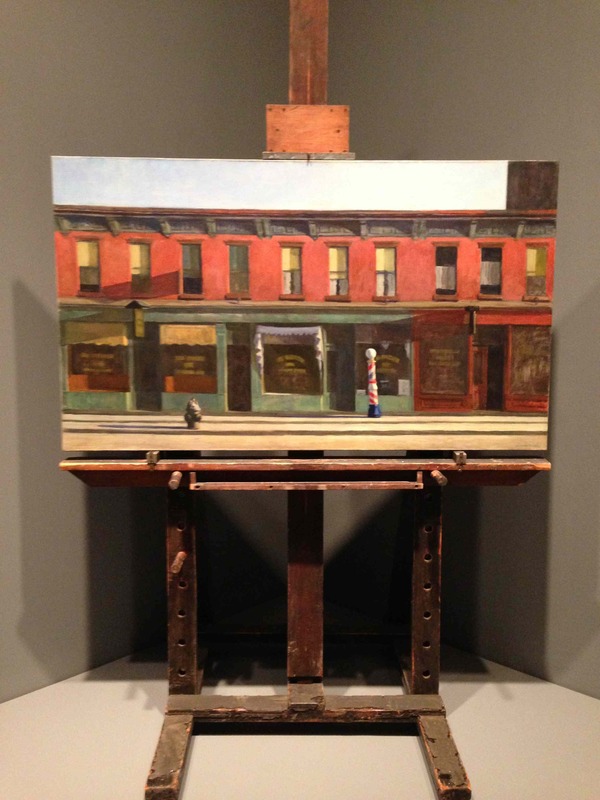 Hopper’s easel holds his painting, Early Sunday Morning (1930) at the Whitney. If you thought you knew about Edward Hopper, think again. The Whitney’s show, Hopper Drawing, provides surprises galore from curator Carter Foster, who has presented the museum’s trove of Hopper drawings in a fresh, new context. The Whitney has more Hopper drawings (made for his private use) than any other museum in America, and about half are up on the walls. Go before October 6. Although Hopper’s representational work is considered by his fans to signify “realism”, Foster has unearthed and organized zillions of preparatory drawings that demonstrate that this is hardly the case. Hopper, as he often said, worked “from fact” but added improvisational touches that pretty much made the canvases perfect. 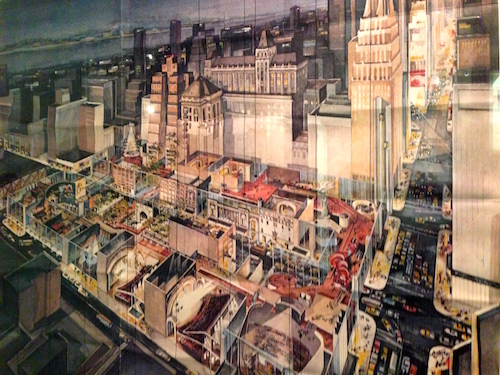 A case in point is New York Movie, where one side of the canvas is “real”, and the other side is completely imaginary. His sketchbook from the Palace Theater proves it. To prove this point, you’ll see the most famous Hopper paintings right alongside his preparatory sketches and sketchbooks to see his meticulous decision making process. 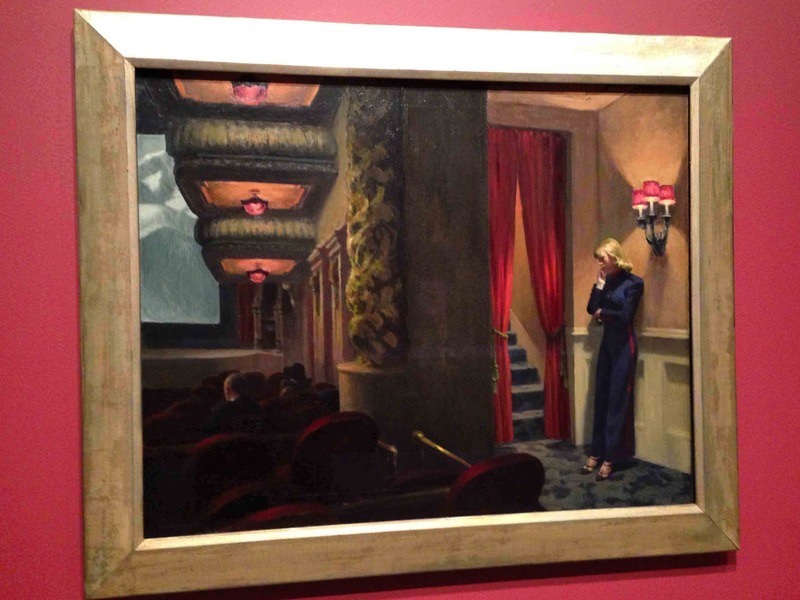 Go to the exhibition web site (or our Flickr feed) and flip through images of Hopper’s iconic oils (such as New York Movie and Chicago’s Nighthawks), followed by sketches and studies where Hopper worked out all the compositional kinks. Hopper lived and worked right inside the row of gorgeous 1830s townhouses along Washington Square North. It’s a complete surprise to find that NYU still preserves Hopper’s studio intact, complete with his print press and easel. 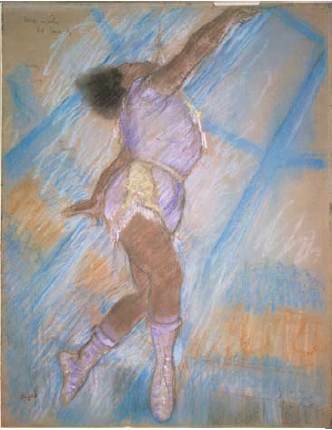 Foster convinced NYU to loan it to the show, and it’s an electrifying reminder that artists once walked the streets of the Village and then came back to paint. You’ll stand face-to-face with the working easel that Hopper used to paint every one of his great works. Early Sunday Morning is perched, right where it sat in 1930, facing the Hopper’s other icon Nighthawks, on loan from Chicago’s Art Institute. The width of those canvases precisely matches the width of the easel. So, that left a question: Where these real places, or fictions made up entirely in Hopper’s mind? Foster spent time trying to figuring it out, and thankfully the Whitney recorded the answers on its YouTube video. Take a walk with him and see the Village and the Flatiron through Hopper’s eyes back in the 1930s. You’ll never look at Nighthawks the same way again. Genius. For theater fans: It’s not in the video, but Hopper’s sketchbooks are also filled with drawings of Times Square theaters — the Palace, the Globe (now the Lunt-Fontanne), the Republic (now the New Victory; formerly Minsky’s Burlesque), and the Strand (where Morgan Stanley now sits). 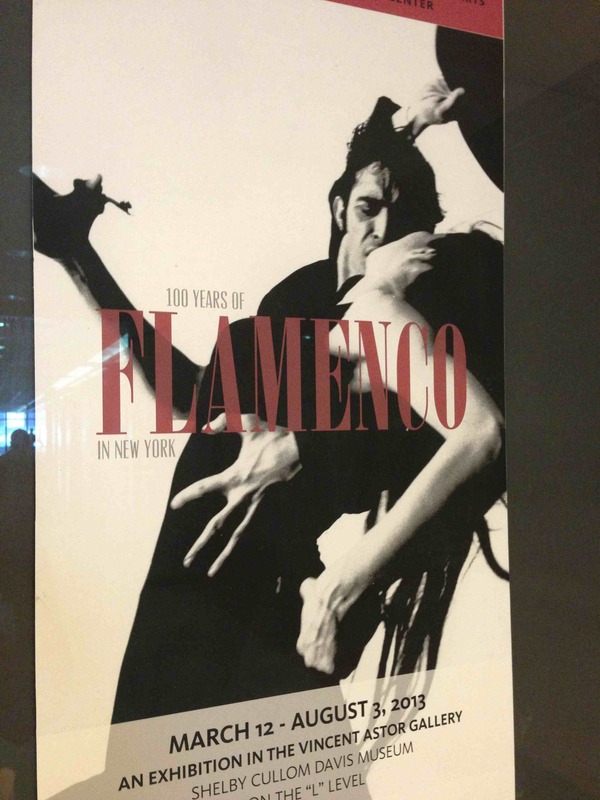 There’s no way to cool off the Spanish heat you’ll experience at the dance-til-you-drop exhibition Flamenco: 100 Years of Flamenco in New York, currently in the last weeks at NYPL’s Library of Performing Arts at Lincoln Center (until August 3). 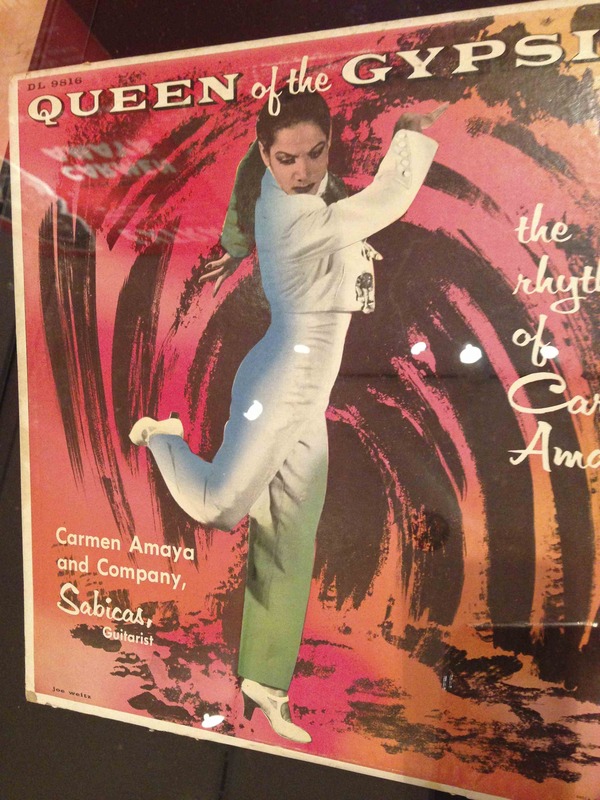 NYPL gives us videos, recordings, a few costumes, and other memorabilia, but mostly you’ll hear the castanets and rapid-fire footwork of the best of the best. Who knew that the first woman to appear in front of Edison’s movie camera was Carmencita, the Spanish sensation who debuted at Niblo’s Garden in 1889, and had a fairly good run at Koster & Bial’s Music Hall on 24th and Sixth Avenue. Her portrait by Sargent is at the Musee d’Orsay and her portrait by Chase at the Met. Here’s a link to Edison’s 1894 flick. This first Spanish-dance craze was further fueled in 1916 by the arrival in New York of La Argentina (Antonia Merce), Spain’s first modernist dance artist who fused classical dance, regional styles, and Flamenco. A decade later, she returned with a full company and presented New York’s first full-length Spanish dance-theater piece. By then, Ruth St. Denis, Martha Graham, and Ted Shawn were already incorporating Latin moves, gestures, and rhythms into their performances, and La Argentina’s company had a spectacular run. Here she is in a solo. 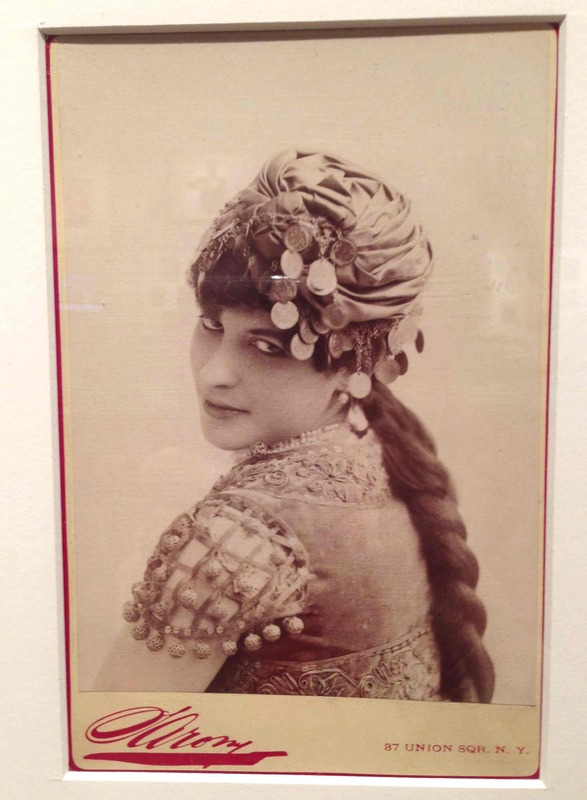 Although there’s lots more to the story, one of the best parts of the exhibition features photos, albums, videos, and recordings of the fast footwork of Carmen Amaya, who Sol Hurok billed as “The Human Vesuvius” in her 1941 New York debut. She could kick the 15-foot train of her dress right into the air. 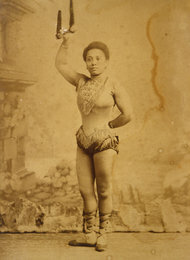 Amaya’s innovation is that she injected a bit of the Gypsy style into Flamenco and was somewhat of a Spanish-dance rule-breaker – sporting tight-fitting trousers to show off her super-fancy footwork. Superstars Dietrich and Hepburn were also wearing trousers at the time, but it was a first in Amaya’s field of work. Good move, Carmen, as shown in this clip from Follow the Boys, a 1944 all-star vehicle released by Universal to boost morale during the War. It’s like watching a great jazz tapper at work. Move over, Riverdance people. Source: Archival clip, Follow the Boys, from the DVD, Queen of the Gypsies, A Portrait of Carmen Amaya. If you’re already nostalgic for the grand Impressionist show that ended at The Met, you can still find your favorites filling the Frick’s two downstairs galleries and the room next to the gift shop. 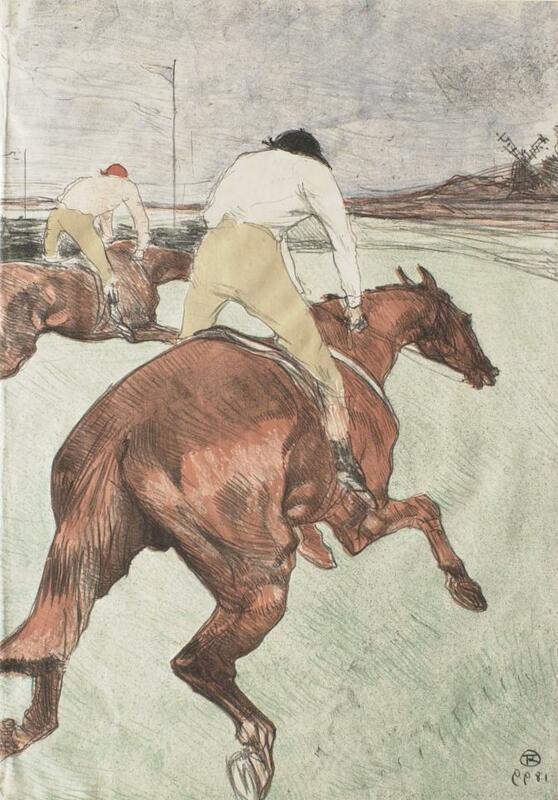 While the Clark Art Institute (Williamstown, Massachusetts) was undergoing renovation, the Frick borrowed some of their finest works on paper for the gem-of-a-show, The Impressionist Line from Degas to Toulouse-Lautrec: Drawings and Prints from the Clark. Although a few politically charged works are in the show (like Manet’s 1874 print of the Commune uprising The Barricade), the majority are masterworks of portraiture, everyday life, cafes, and modern entertainments like horseracing, circuses, and boulevard promenades. Some of our favorites are Degas’s sketches of horses in motion and Lautrec’s circus-themed sketches that he drew from memory while in rehab. If you can’t get to the show, the Frick web site allows you to peruse all of these works in detail (with the curator’s descriptions) by decade, by artist, or by the order in which they’re hung in the exhibition. 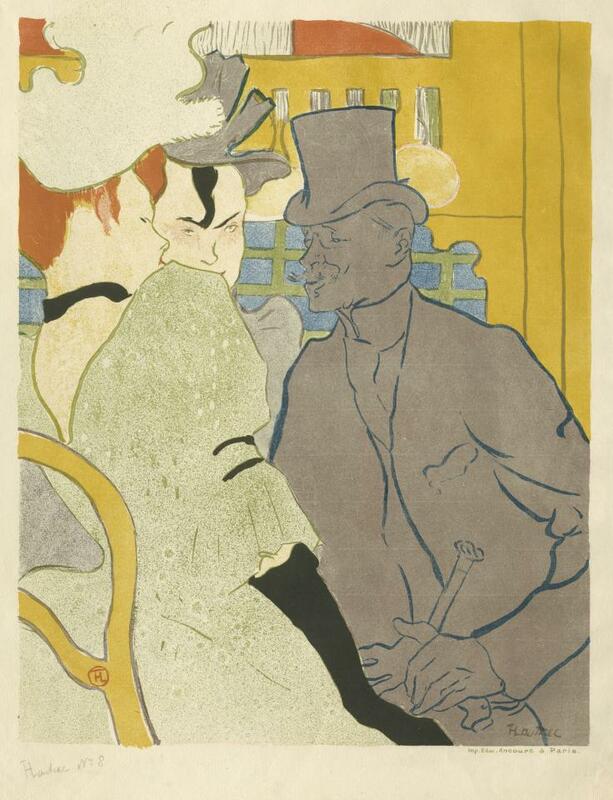 For sheer theatricality and delight, Lautrec takes the cake in this show, as shown in the images here. 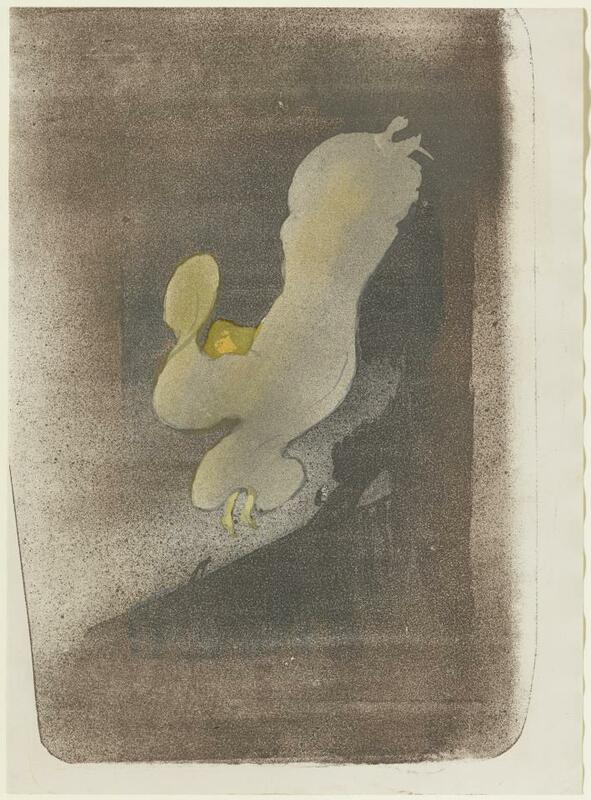 The hand-painted 1896 Lumiere Brothers film below shows silk-clad modern dance pioneer Loïe Fuller making the moves that inspired Lautrec to create dozens of experimental lithographs (sprinkled in gold and silver powder, no less!) of her abstractionist performances. Yes, it’s all about the line. If you have time, watch the video of the co-curator’s lecture about Impressionist line and how sketches, watercolors, woodcuts, lithographs, pastels, and improvised etchings created a revolution in affordable art. 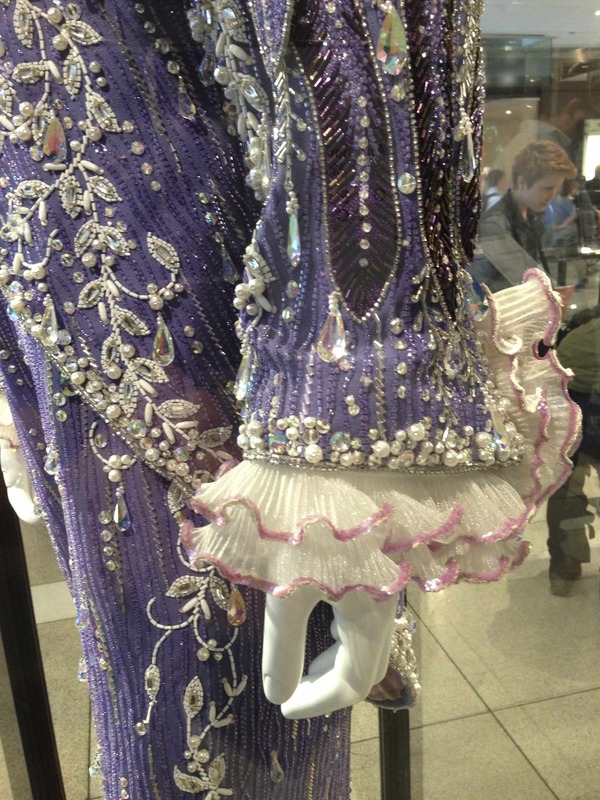 The colors, crowds, finery, and promenade in Grand Central is every bit as celebratory as the famed Easter Parade on Fifth Avenue, except there’s live music and horses. 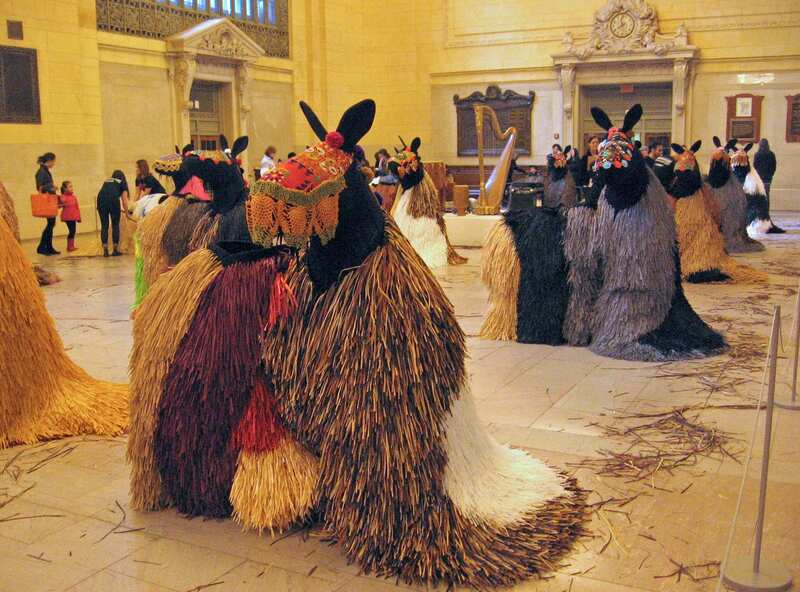 It’s all part of Nick Cave’s monumental performance Heard NY going on each day at 11am and 2pm in Vanderbilt Hall. 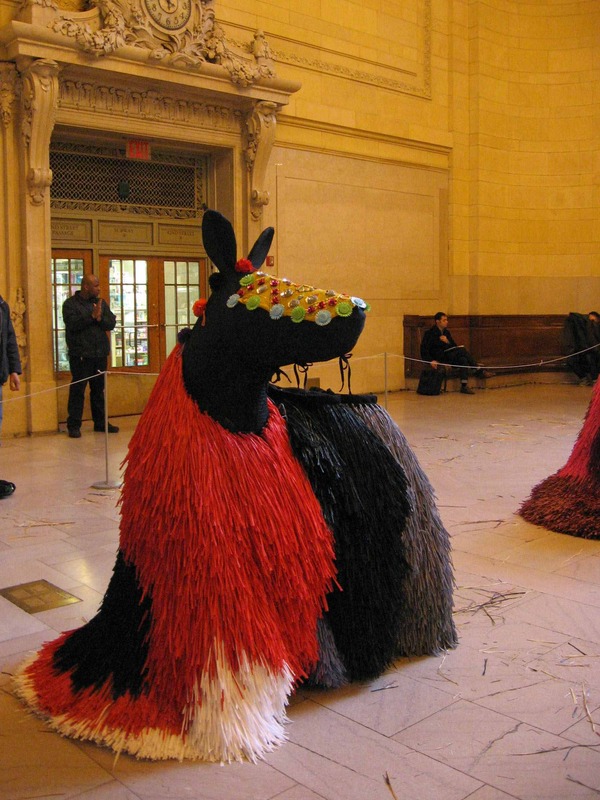 Get there early and take your cameras to see The Ailey School students don the two-person horse costumes, created out of raffia, to whoosh and swirl away to the drums and harp. Take a look at the Flickr photos of yesterday’s 11am performance. Creative Time and MTA Arts for Transit have decided to use both sections of Vanderbilt Hall for simultaneous performances, so you have lots of options to see the 30 magnificent horses close up. Afterward, you’ll see the volunteers grooming the horses, so there’s lots of opportunity to check out the loving detail that Cave has given each of them.